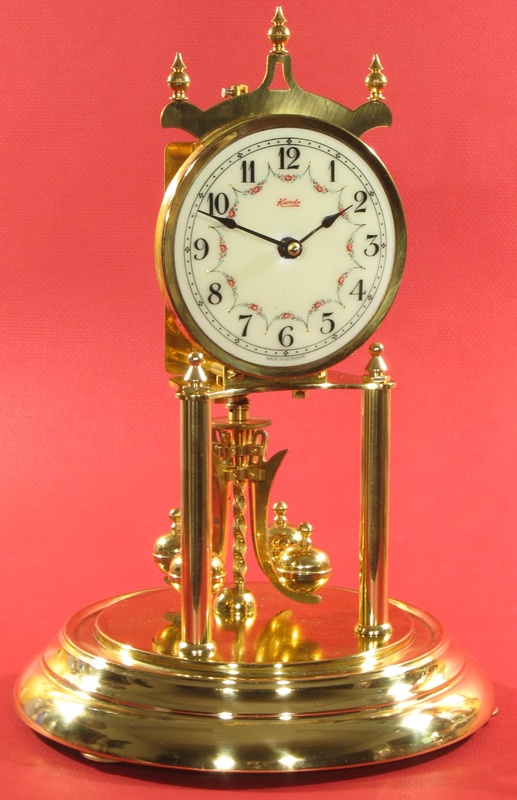 This is an ordinary Kundo standard-sized 400 day clock made in the 1950s. Normally, I go through my standard repair process, and the clock works well. This clock didn’t work well after repair. It ran, but the pendulum rotated only about 3 balls (where 4 balls is one full turn), and sometimes it would stop. 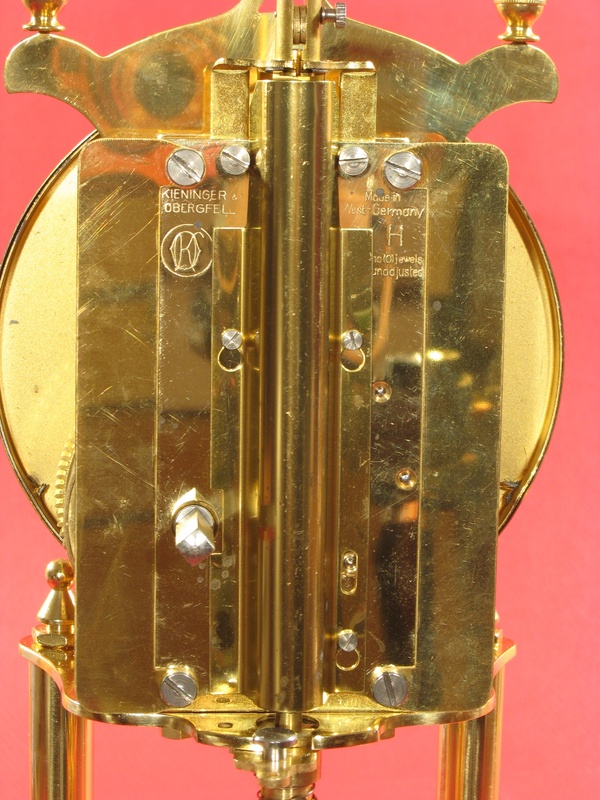 Normally the pendulum rotates 3.5 – 3.8 balls with the mainspring wound 2 turns. Each adjustment I made seemed to help, but after an hour, the pendulum motion would decrease. Tightened the fork on the suspension spring. Finally, I tightened the lower block in the pendulum (this clock has a locking pendulum; and the lower block slides up and down in the top of the pendulum). I squeezed the top of the pendulum together to reduce the slot width, and the clock worked perfectly! Repair job 6319. Polished 6 pivots, cleaned, installed new .0032 inch suspension spring. 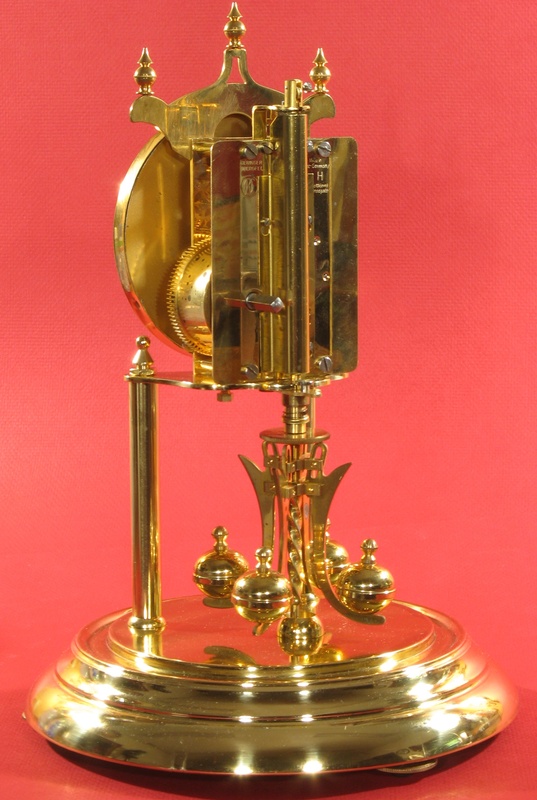 Mr. Stoddard; I inherited what appears to be a beautiful,Kundo 400 day clock, but the pendulum is off and the two pieces that hold the thin wire are off. It appears to be in good shape otherwise, but I’m wondering if it is possible to mail this clock to you for repair, or if you can recommend someone in the Minneapolis area who might be able to get it running for me. It’s much too pretty to be sitting on the shelf gathering dust. Also, can you tell me the approximate cost of repairing it. If it exceeds the value of the clock, then it would probably be foolish to have anyone work on it. I don’t have a sentimental attachment to it other than thinking it is beautiful and I would like to have it work again. Thank you for any information or suggestions you might be able to give me. Rotate the top block – the saddle is friction mounted. Do you have suspention spring of this model for sales? Do you hawe a 400 days clock from 1950 for sale. Pleace give me your best price. No, 400 day clocks don’t strike or chime (except for a few rare ones). Does this 400 day Kundo clock chime on the hour ?